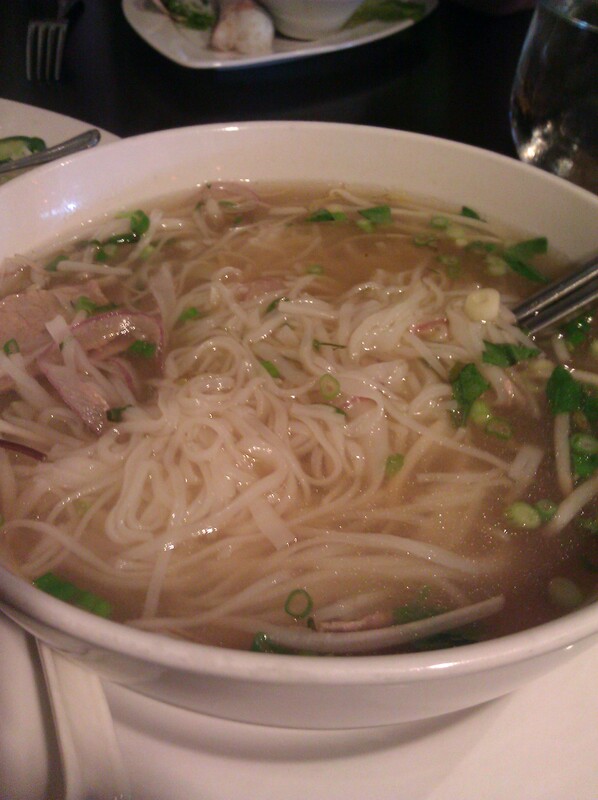 If you are in Woodmere or Beachwood and are craving some decent Vietnamese food, Bowl of Phở is a good choice. It is located in the strip mall where Corky & Lenny’s is, but it is tucked all the way around the corner on the side street off Chagrin. It is a family-run restaurant that opened in 2011. This review is based one two separate visits. I left pleased with the food both times. 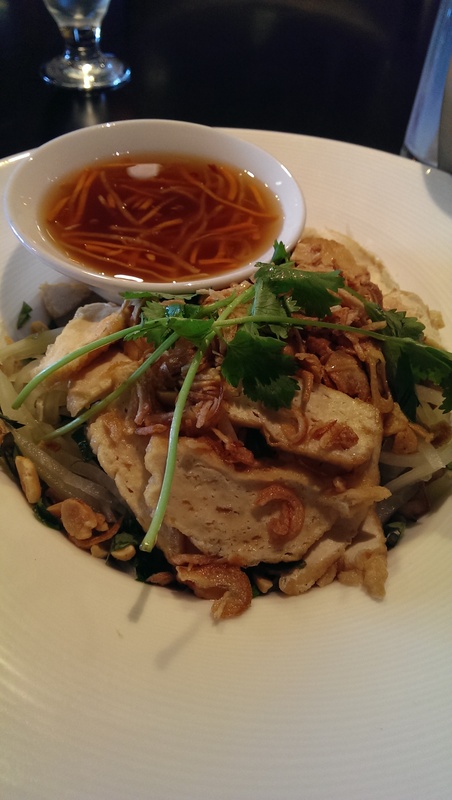 It isn’t Superior Phở, but it is a good choice for the suburbs. I met a friend for lunch there the first time. 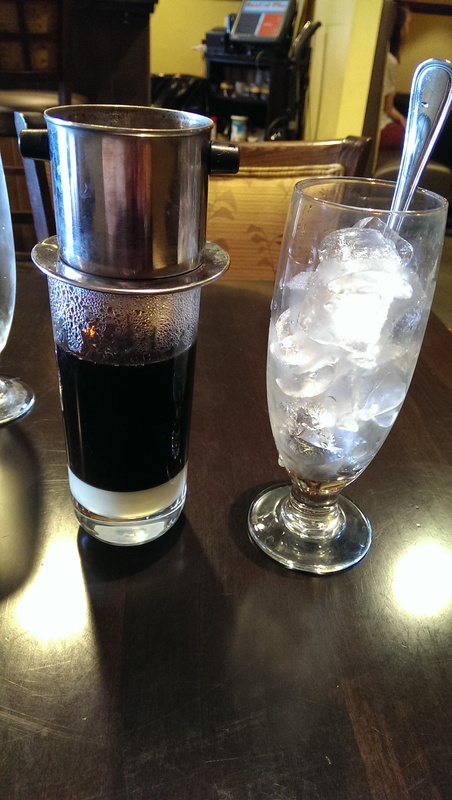 I started with a hot Vietnamese coffee (Café Sữa Nóng), which gave me a strong jolt of caffeine (and to be honest the shakes). The coffee here is not for the faint-hearted. 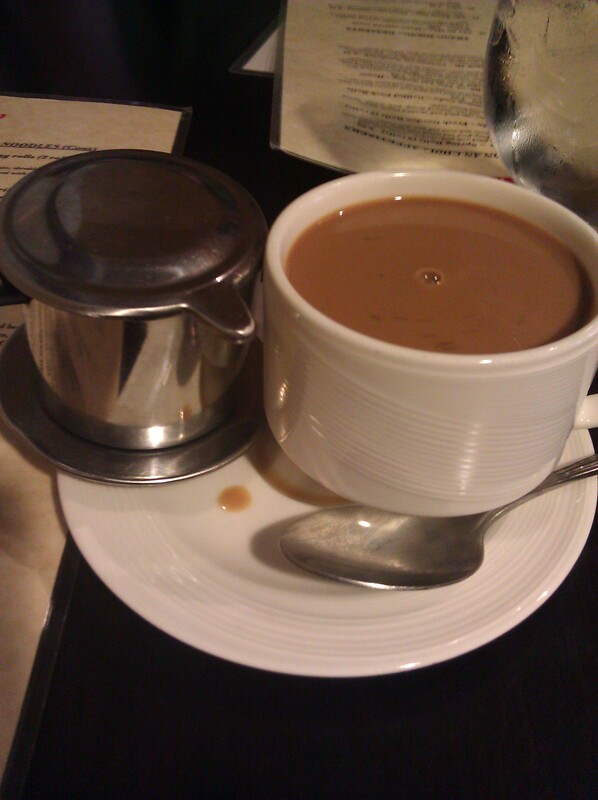 Vietnamese coffee preparation is unusual in that it consists of hot water and a small metal pot. It looks like a hat and sits on the top of a coffee cup. Inside is a chamber for coffee and room for hot water. It is very basic and simple. The preparation of the hot coffee was a bit awkward, because I didn’t have anywhere to put the metal coffee filter when the water was finished percolating. I ended up balancing it on the coffee saucer with the cup, which was just super awkward and frankly messier than I wanted. A saucer for the filter would be a nice touch. My second visit I went with the iced coffee (Café Sữa Đá), which at least gave me somewhere to stow the filter (back on top of the brewed coffee, but it still dripped on the table a bit). 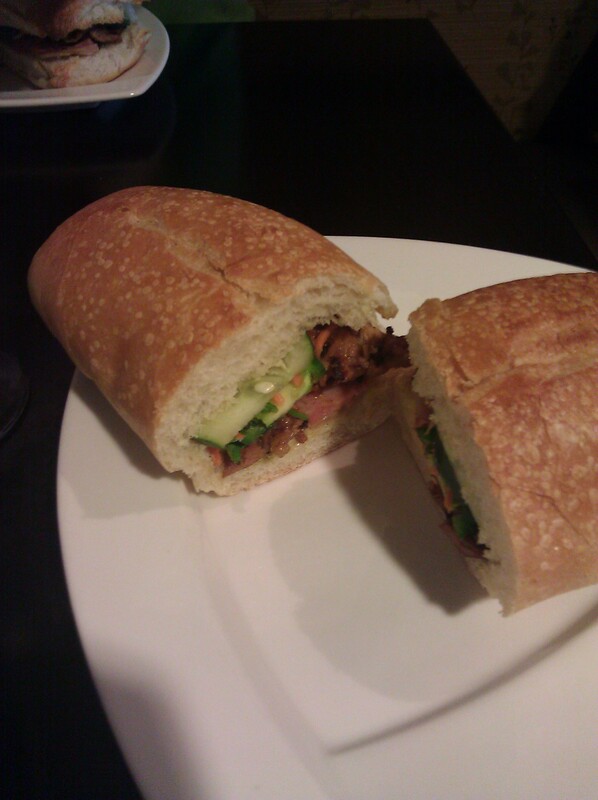 On my first visit I ordered my usual – a Phở Tái and a banh mi. The phở was a pretty decent phở. The accompanying add-ins included bean sprouts, Thai basil, jalapenos, and lime quarters (!). It contained a lot of noodles and some beef eye round. It wasn’t packed with meat, but it had a lot of noodles and filled me up nicely. The broth was flavorful. I enjoyed it. The banh mi featured a warm baguette topped with thinly sliced pickled carrots, daikon radish, cucumbers, cilantro, chili peppers, pâté, mayonnaise, grilled pork, ham, and head cheese. I don’t remember it wowing me like the one at Saigon Grille or even Superior Pho. I think it is because of the bread. It was a little firmer and denser than I prefer, but the fillings were really good. It was a decent banh mi for the price. On my second visit I was in the mood for something light after my 90 minute massage across the street at Massage Envy. I ordered a Bún Tôm, Thịt Nướng, & Chả Giò, which features grilled shrimp, your choice of meat (beef, chicken or pork), and a spring roll with vermicelli. I had ordered something like this before at Minh Ahn and didn’t really have a fond memory of it because I found it too dry. This one blew me away. I loved it. The house lime dressing for the rice noodles, bean sprouts, mint, ground peanuts, and shredded salad and cucumber was delicious. I chose the grilled pork and really enjoyed the flavor. The grilled shrimp and pork were a nice complement to the underlying “salad.” The egg roll was perfectly fried and nice and crispy. I also ordered the Gỏi Đu Đủ (papaya salad) thinking it would be a smaller salad than it was. It features fresh julienne papaya tossed with basil leaves and crushed peanuts. It comes with your choice of steamed shrimp or pork, but I went with the vegetarian version and got some nicely prepared tofu that soaked up the house lime sauce quite nicely. I was not expecting it to be as big as it was. I was thinking it would be a nice side salad to complement my Bún Tôm. It would have been really nice to share with someone. I ended up taking it home and having to eat it later that night, because I don’t think it would stand up overnight. In short, I think you can’t go wrong with this restaurant. If you are looking for a restaurant that uses fresh ingredients and blends them together well you are in the right spot. The place is clean, the service is attentive, and it is a bright and cheerful place to eat a meal. They are open from 11 am-9 pm during the week (until 8 pm on Sunday and 10 pm on Friday & Saturday) and are closed on Tuesdays. They also offer take-out for local business people on lunch breaks. Oh, and they have free WiFi. 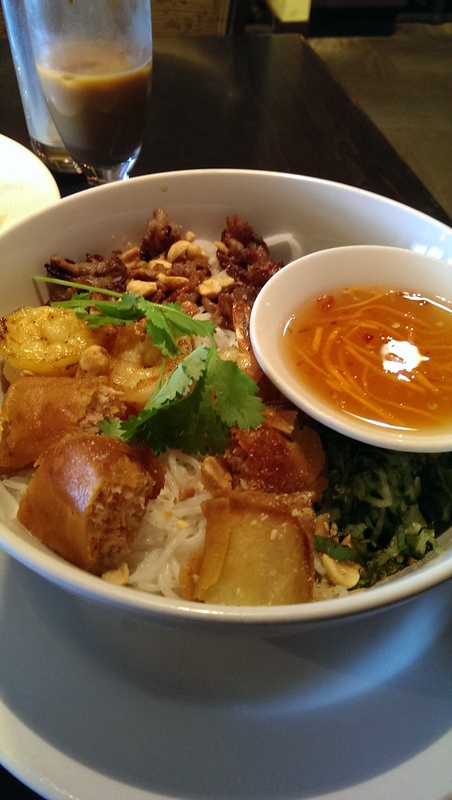 I love having good Vietnamese in Woodmere – we go here a lot! I really wish restaurants would offer a side salad portion of the papaya salad – they are always huge and almost the same price as an entree. Give me a smaller version for $5 and I’d order it every single time!